Eastbourne Borough defender Gary Elphick believes Saturday's trip to Woking will give them an idea of their prospects in Blue Square Bet South. The Cards currently lie second in the table, while Borough sit 11th. 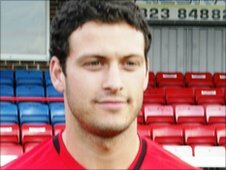 Elphick, 25, told BBC Sussex: "Before the season started I always thought Woking would be up there. "It will be a great marker for us to play against them. We've a bit of confidence behind us and fingers-crossed we can pull a result out." The Sports have won three of their opening seven games following relegation from non-league's top tier, but Elphick believes they will get stronger once they have a fully-fit squad. "We've had a lot of injuries and suspensions and it's caused us to have quite a small side, physically," he added. "In this league, you can struggle with that. "Eddie Hutchinson will be back soon and Gary Hart and Ben Austin are chomping at the bit to coming back. "If we can stay under the radar and hover around the play-offs, then get a few players back to full fitness, the future could be bright down here."